I am not sure if you know, but last week, I FINALLY PURCHASED MY WEDDING LEHENGA! Woohhhooo….yayyy, one major work of the wedding done ! Pheww…I spent months looking for the perfect outfit for my big day. From attending wedding exhibitions, seeing Lehenga prices where I have counted zeros at the end, to going by myself after lectures to different stores – being told to bring family along – having my (old) dream lehenga stolen at Seasons and much more…I have seen it all. And while all this has not made me some kind of an expert in Bridal Lehenga selection, it has definitely made me a little wiser. In the war of finding your dream lehenga, nobody is really your friend – definitely not the stranger next to you who has come with her own agenda, or the salesman – who wants to sell you the costliest piece at the costliest price…or your friend for that matter whose taste wouldn’t match with yours and all you are left with is more and more confusion. The only friend you have is YOU ! So given all this pressure, I thought let me help you break down the problem at hand. If you are sure of what you want before you enter any store, it just makes life that much simple. Neither would you get frustrated easily for not finding everything you want in that one outfit nor would you waste time at a store looking through 100s of options pointlessly. So, let me ask you…what is your Lehenga priority? #1 I want FULL FLARED !!! You? I knew this from Day 1. No matter what, even if I have to sit in a plain skirt for that matter, I want gher in my outfit…I want to twirl around…that little princess feeling…I want to feel like a princess that day, sorry….so I need it…anyhow ! No compromises there. Now given my budget, under 30k…this was a next to impossible task. At least here in Mumbai from what I have seen the normal kalis one gets in this budget is no more than 12-14…its practically figure hugging – those fish cut kinds…why -> because your budget is not accommodating…rubbish ! What kind of Lehenga fit do you prefer? Please don’t settle for anything…wait it out…there will be something better in store…you need to have this happy feeling…only then its worth it ! I wanted to stay under the 30k range for multiple reasons…I understand its once in a lifetime…but I see it as its once only…3 hours…max 5…for that I cannot just spend up xyz amount…never to be able to wear it again…I know you might find that a bit strange..but I just couldn’t get myself to spend more. I would suggest finalize a budget before stepping out to see the Lehengas. If you’re not strong minded, definitely your budget will go higher…and you might just regret it later. So be absolutely sure about what you wish to spend on your Lehenga. In most cases, whenever I visited some stores and said my budget in maximum 30k, those smarty salesman started showing lehengas from 33k onwards. “Thoda idhar-udhar toh hota hi hai na“…..NO ! 30 means 30 including all stitching, extra additions every little thing. In 30, I want my Lehenga to be ready to be worn – without any significant or insignificant plus and minuses. Don’t budge from your target…all the salesman are hoping you do. They get higher commission for higher purchases…don’t give them that joy at your expense ! #3 I chose Pita. What do you want? I think zardozi looks really rich…specially like on velvet…the stolen Seasons Lehenga was complete zardozi work with mirrors and it gave a very royal rich look. But anyhow, no more crying about that. Then, lastly there is sequins…Now, sequins look really nice and I have seen too many options this season but they were mostly for fusion wear – in gowns and floor length anarkalis. If the sequins work suits your tastes, make sure you ask the salesman to show you those pieces only. Its important to know the work that appeals to you. That way you can drill down to shortlist your Lehenga! I am in love with the Raw Silk fabric. I don’t why – but its everywhere these days, and thank heavens for that. Raw Silk has just the right amount of shine of its own and can be teamed up with practically any kind of work – from gota patti to zardozi and even pita. Satin on the other hand is everywhere. Net always goes well with satin. But from what I have seen, satin always has those diamond stone work on the Lehenga. So do check out couple of pieces to get an idea of whether you love the fabric. Mostly in cases of satin, they put net over it to give some bounce to the fabric. A fabric is going to make all the difference not just by look – by touch-feel, the way it falls once stitched. For eg, raw silk, brocade, jacquard stays pretty set but satin, chiffon and the likes have a very fluid like feeling. So if you are anything like me obsessed with gher, you might not get it in these fabrics. In my 30k budget, I don’t remember seeing even one brocade work lehenga ! Super important. But equally important is to have options – not just set your eyes on that one color…sorry, one shade. you are just going to make your life hellish if you narrow down your choices to just one or two. Drill down to some broad shade of colors to work with. More often, it so happens that may be you have something in mind..but when you go to any store you will realize that some other shade actually looks better on you. Its important that you be open to accepting those facts. I want you to be happy too ! This is kind of a minor point if you ask me, but nevertheless important. Now, Lehengas blouses cost a bomb to give for stitching to any designer – like easily 3k upwards. Given you have a budget in mind, wouldn’t it then be better to see outfits which are already stitched and require minor alterations? The advantage here is that you get to see the final product at first look. In most cases, stitched blouses require lots of additions to make it look more regal and opulent. When it comes to stitched blouses, they already take care of this aspect for you ! There were many stores which were showing un-stitched Lehengas as well meaning, one side open…or just the work part…all the can-can and stitching was remaining. In such cases, you can’t really tell how it would finally look when you wear it. Plus, then their store stitching charges range anything from like 3-4k to much higher as well in some cases. My suggestion – Check out stores which give ready-made options first. Why should you do extra mehnat ! #7 Custom-Made from a Local Designer? The most dreaded options for me. What is the guarantee that what you see is what you will get? I know there are many who have their local designers who do outstanding work – may be its ok for them. But its the Wedding Lehenga…how can one take chances? Its just too-too scary I feel. What if it doesn’t turn out as you had imagined? What will you do then? What if the color what you had perceived to look good on you, once all made doesn’t make you feel all that good? Then what? What if your vision and the designers vision have some sort of communication gap? Who takes care of all the post Lehenga made madness? Is there anything else on your priority list? 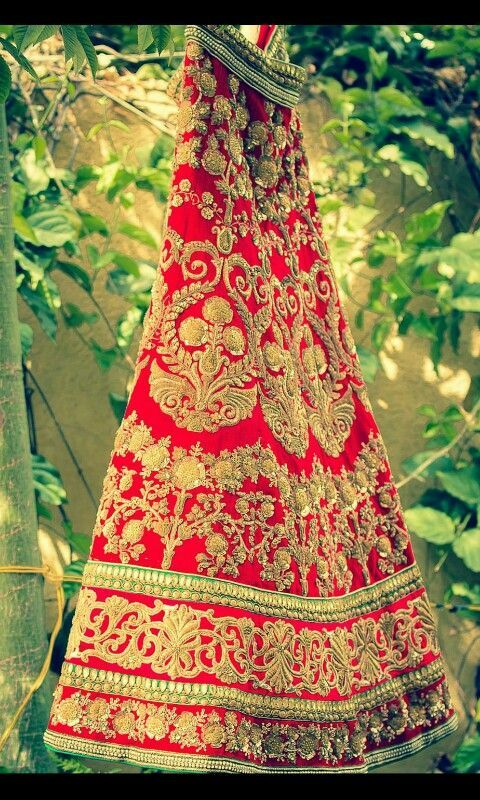 Would you prioritize these points in any other way for your Wedding Lehenga? its exactly what I am looking for….same choice. hav eu posted any pic of ur lehnga here? You can have a look at my wedding lehenga pictures by clicking here.